All the lonely people… – ChezWhat? 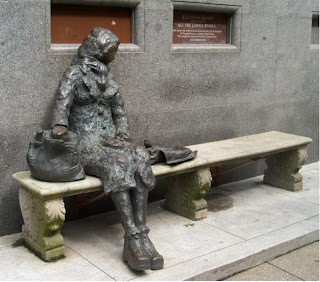 This statue is “Eleanor Rigby” per the Beatles song of the same name. It is in Liverpool, England. I promise to post about a happy topic soon. But for now, lately the radio has been talking alot about people who die and there is no one] to bury them. The link to this story here. It was on This American Life, called Home Alone. They did this special about a woman in Los Angeles who worked for the county government. It is her job to go into the houses of people who have died and figure out who the relatives are. This way the deceased can get a proper burial. She described the house of one woman in a sort of “on the scene” interview. The woman had died. She was in the morgue. Because she needed to be buried, and the family needed to be notified, they sent this county employee to the home to find out if the deceased had any relatives to bury her. After several days of going through this woman’s stuff, she is able to place a couple calls to connect her to someone. The someone doesn’t know her, but thinks his wife might. The wife says that she thinks the deceased woman might be something like the stepmother of an aunt that married into the family or some such distant relation on the guy’s side. They never really seem to clear it up, but the guy says on radio that he wants to do his duty for the woman. Someone else apparently pops up in the investigation who claims the woman. All of a sudden there are now two people. And for the county employee it is on to the next case. But what if they don’t find anyone to communicate with? This happens too. Every year there are at least several hundreds who die and no one claims them to bury them. Every year they have a mass burial of these people at a cemetery. They have mass lots, each with a different year, they bury all the people together. Then another story about a woman who died after five years in convalescent care, during which time not one single person ever came to see her. Olive Riggs. This story takes place in England, and so the investigator in this case puts an ad in the paper. Olive Riggs. Some people respond, but mostly to offer condolences, and no they never actually knew her. Weeks later, someone who might have known her calls. I keep getting these inputs. I think about the elderly I have known, and know now. I don’t really understand how it can happen that a person ends this way. But then I know families with a distinct live and let die mentality towards their brothers and fathers and grandmothers. I don’t know how to end this elegantly. This whole story is distressing. It makes me ask what is going on? How can this be? And it brings me back to ideas of losing community, what we got in exchange and whether it was worth it. When I looking into the Amish a year or so ago, their life seemed to exemplify starkly the trade-off for community. They have amazing strong communities. Their close knit-ness from bloodlines, same churches, living arrangements, marriage celebrations, same schools, common traditions bring them together tightly as a community. There is never a problem of finding a babysitter in an Amish community. In Rumspringa, kids are released from the standards of the Amish community. Most all of them come back. The trade off of 221 channels of direct TV, cars, jeans, beer, video games, movies, books, stylish sneakers and buttons (yes, buttons, because women in some areas can only use pins) isn’t worth the relationships & community that carry them through life. So nicely written. I once had a friend who was Danish. She was telling me that in her town there is lots of unemployment and underemployment because people aren’t willing to leave their home and live elsewhere just for a job. I thought of my own family- scattered across the country, very typical of many American families. A sense of community is so important. And it’s up to everyone to include others in our community- we can’t just wait for other people to do it. Thanks for this – it made me think. And I LOVE This American Life.